The Red Panda is a small arboreal mammal and is the only species of the genus ‘Ailurus’. It eats mainly bamboo but is omnivorous and may also eat eggs, birds, insects and small mammals. 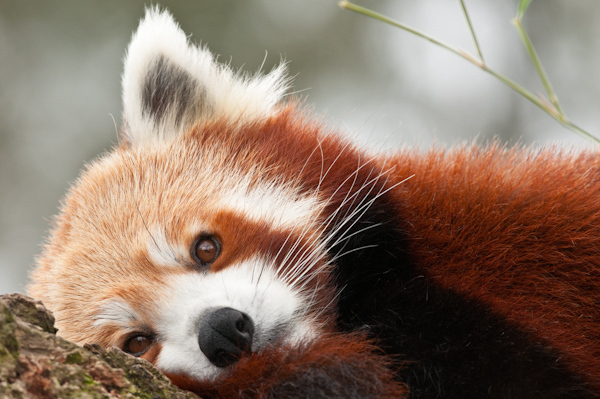 Endemic to the temperate forests of the Himalayas, the Red Panda ranges from Nepal in the west to China in the east. It is also found in northern India, Bhutan and northern Myanmar. The Red Panda is also called 'Lesser Panda', though due to the pejorative implications of this name, "Red" is generally preferred. Although it is protected by law in all countries where it lives, its numbers in the wild continue to decline mainly due to habitat loss and fragmentation, poaching and inbreeding depression.